Pong with a catchy beat! Much like Pong, you still move your paddle around by tilting the Wii Remote, but in this unique WiiWare title you'll have to bounce the blocks off your paddle in rhythm with the pumping musical beats the game makes use of. The sound of the blocks bouncing off of your paddle will even give off musical notes that will blend in with the background music if you time it correctly. The patterns of the blocks gets increasingly difficult throughout the game, especially during the game's boss battles, so you'll have your work cut out for you if you expect to play through the entire game. You'll always be able to tell how well your doing by the music and visuals in the background. If you're playing poorly the visuals will be basic black and white visual patterns and the music will only be simple beeps, whereas if you're playing well you'll be treated to much flashier visuals and music. The game will even allow you to team up with up to 4 other players in a cooperative game play mode for increased intensity. Beat will only be the first of up to five Bit.Trip releases from the developer, so this game will only be the beginning if things go according to the developer's plans. We'll have more information on Bit.Trip: Beat as it becomes available, as well as a full review once the game hits the WiiWare service. Sounds interesting. I like simple classic gameplay paired with music lately. Could be worth a look. This is a game to keep my eye on. I'd rather play Plasma Pong. All right, another set of games coming in pieces! I missed having one around. Looks pretty cool. Full review and price will be the big factors for me. Sounds really fun to me! I will definitely buy this and Liight. 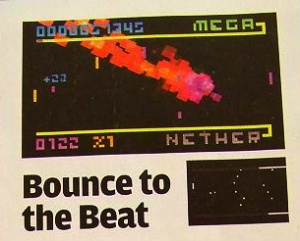 I love music-based games, but I find Pong to be pretty boring, so this doesn't really tickle my fancy. I love the game Pong, so I'll probulay get this. For me the game would be permanently black and white so I'll pass. Great, I'm pretty sure I'll purchase at least one of the 5 games. I don't know about this one, though. I will wait for a Review. Musical Pong? Count me in. This announcement was a little anticlimactic, but this might end up being fun! Didn't I suggest a while ago that someone should make a new Pong variant? Anyway's... looks good - can't wait for more info. If the review is good i'll buy it. I have no idea how well this will turn out, so I'm relying on you all. Very interesting. If the price is right, maybe I'll download it.